Lynsey has completed courses in corsetry, dressmaking, and pattern cutting and enjoys sewing in her spare time. Do you want to make your own corset? Obviously- I'm reading this to see what I need. No- it looks like too much hard work! No- I am hopeless with a needle and thread! I recently decided to attend a corsetry course. Obviously, I wanted to learn how to make corsets from scratch, and how to alter them later if need be. 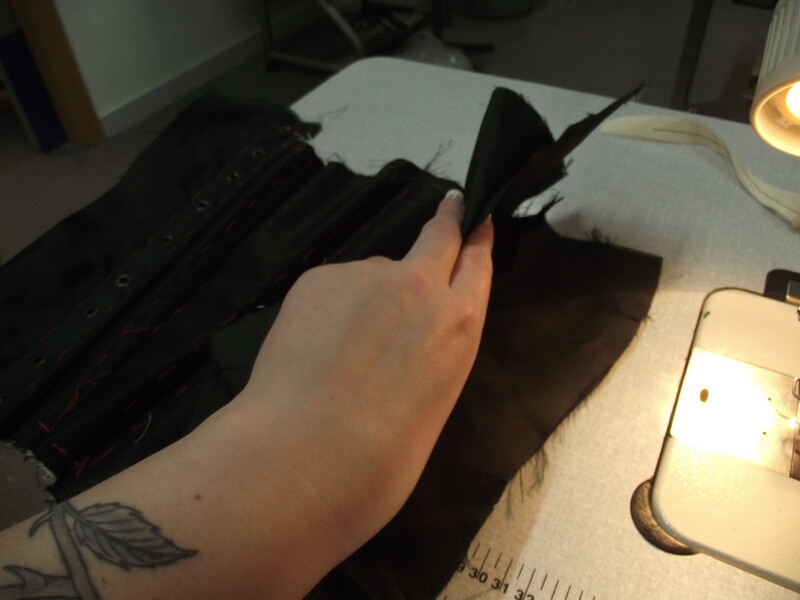 The course also covered the history of corsets, giving an insight into their origins and future. 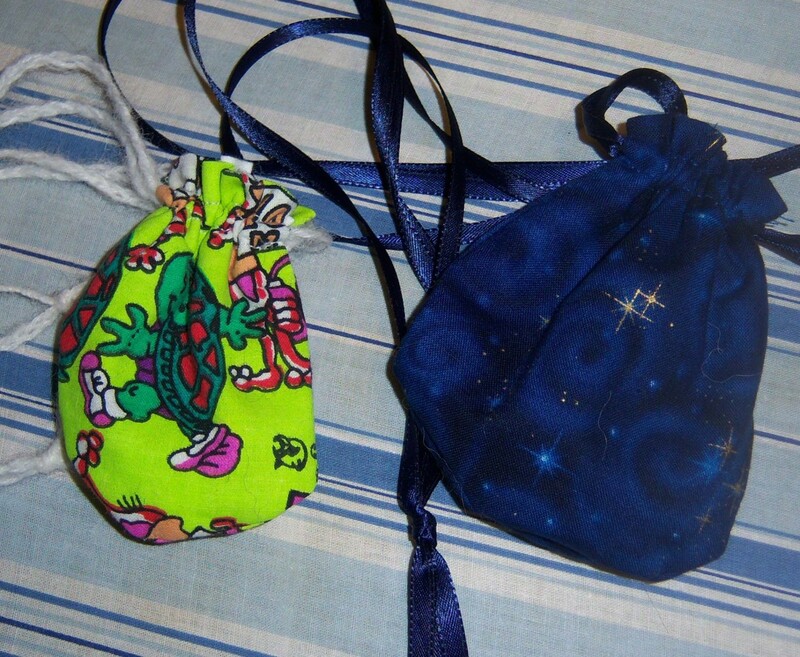 As a relative sewing novice, I thought the best way to go about this was to go to a class, because simply following a pattern can get a little tricky, and it's always handy to have someone at hand when things go wrong. With this in mind, I decided to keep a note of my progress over the 10 week course, and post the results at the end. But why stop there? I thought it would be best to show my progress, step by step, so that other aspiring corseteers have more than just a pattern to follow. 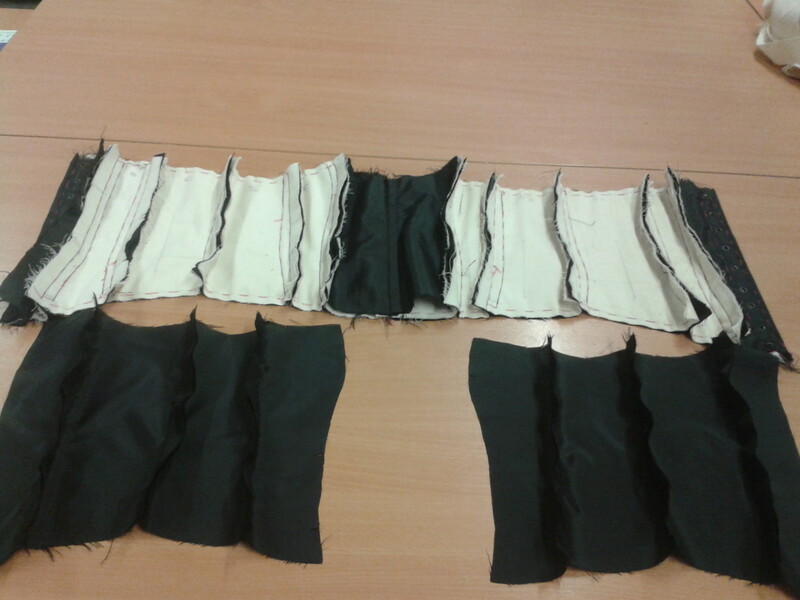 Be aware that making a corset does take a lot of time and effort, so be prepared for sore fingers and wonky eyes! This hub will show you, step by step, how to make a corset. While I will be making a standard 6 panel (on each side) corset, the steps can be used along with any pattern, and I will share any issues I had along the way. The detailed photos will help along my explanation of how to put the corset together, from cutting the fabric out, to sewing it all together and sealing the steel bones, all the way through to finishing off the edges and inserting the strong eyelets. The Waisted Efforts book (while expensive) gives a really thorough look at all of the different methods of corsetry and their historical use. It is a really thick book and written well. 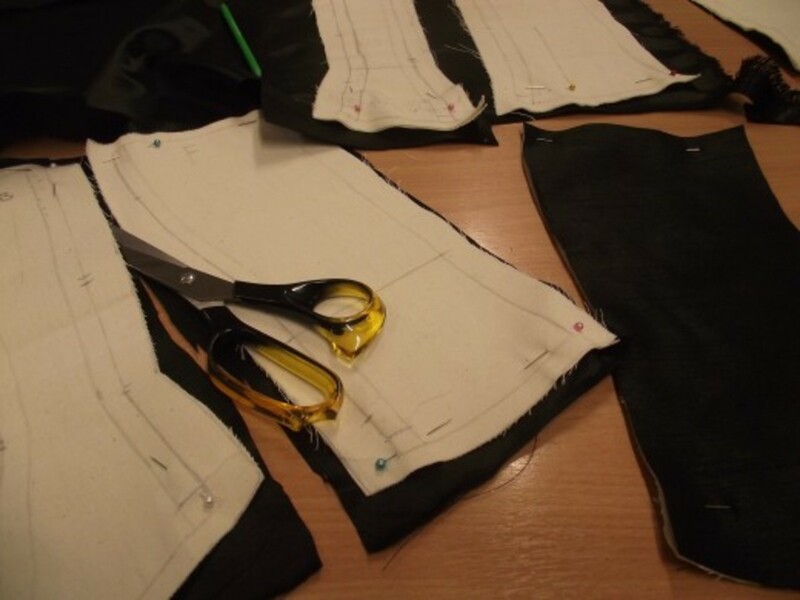 It explains the practicalities of corset making and also shows how to draft patterns. Everything you need to know about corsetry is here. It's worth the investment if you are serious about becoming a corsetiere. The first step is to cut out all of the pieces of your pattern. Ensure that the pattern you are using is for the correct size, by measuring, just incase it has printed out wrongly. This is especially important for print at home versions. If not, scale up using a photocopier. 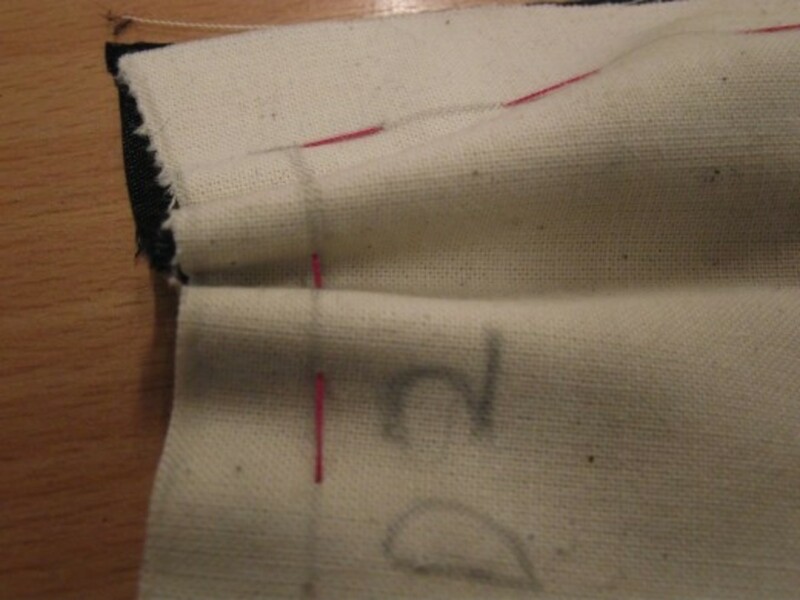 There is a handy article here on how to do this, however bear in mind that corset measurements are very unique and you don't want to change the lengths, so it will be better to redraw (baking paper is a great resource to use for patterns, and cheap, too!) If you are between sizes, it is better to go for the size larger, because it is easier to take in than to let out. Once you have cut out the pieces, lay them out onto your Calico fabric, and secure with plenty of pins. 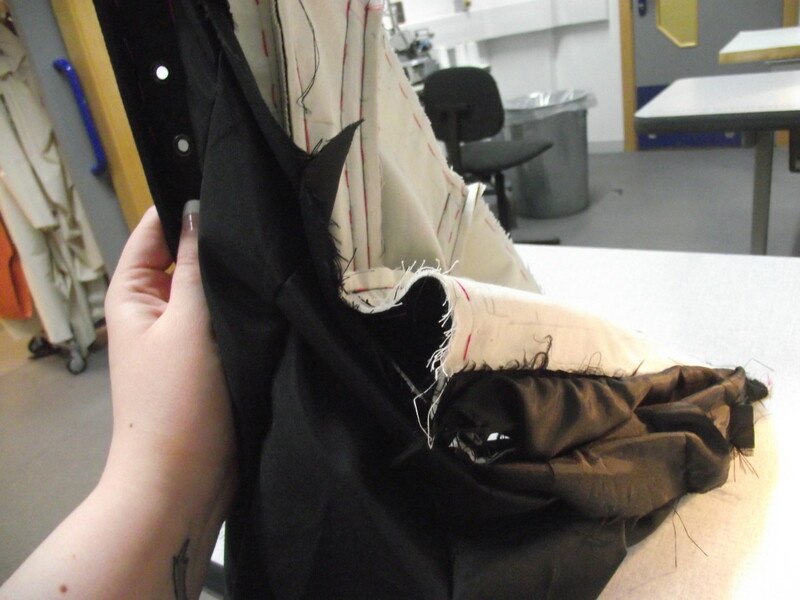 We used 2m of calico fabric, and folded it in half, so that there were enough layers to strengthen the corset. Once folded, the fabric was ironed to ensure that the pattern transferred onto a flat surface. 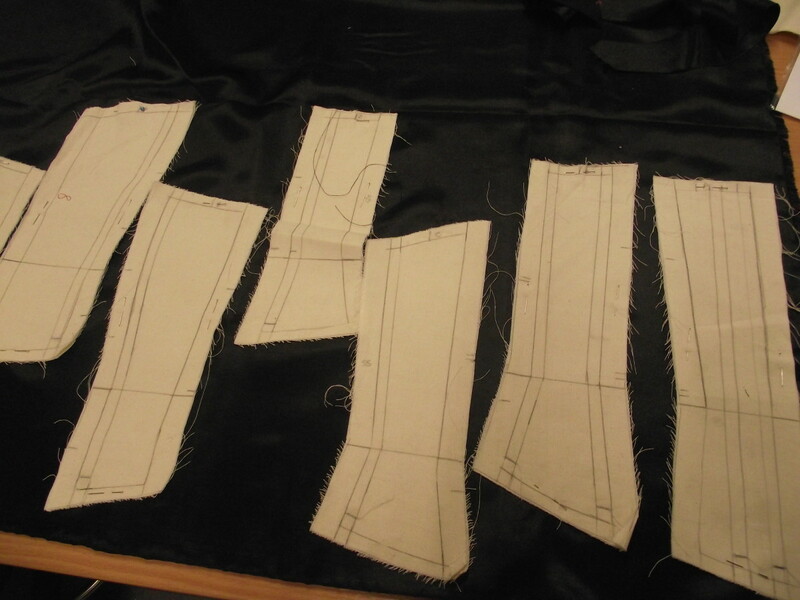 When laying out your pieces onto the fabric, make sure that you allow extra room for your seam allowance. This should be 2cm around the sides, and 1cm around the top and bottom. 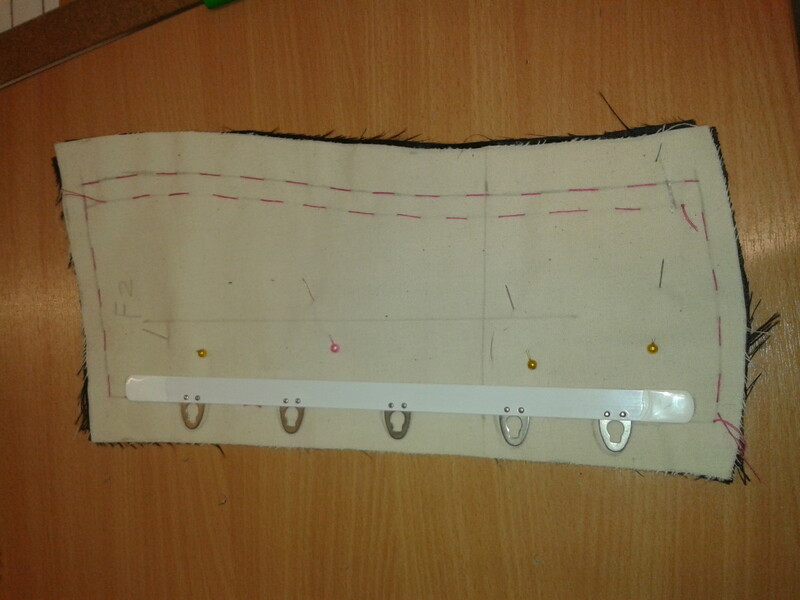 Draw around each piece, and then draw round roughly for your seam allowances- 2cm at the sides, and 1cm top and bottom. A nice dark pencil is best for this, and remember that these layers will not be seen! Like many corset patterns, the pattern I used only had one side on it, so to get the other side, I flipped each piece over. This ensures that all of the corresponding pieces for each panel are the exact same size. I recommend writing at the top of each panel, the panel name i.e A, B, C... A2, B2, C2, so that you can easily tell which pieces are which and know that they are the correct side up. The photo below shows how it should all look once it has been drawn out. Lay the pattern pieces and trace carefully. 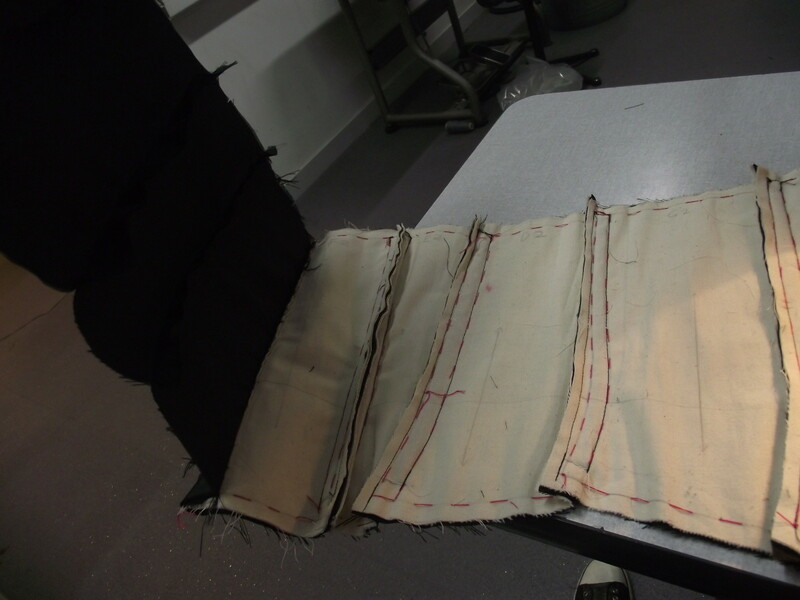 Now, begin pinning each section together to prevent the fabric moving when it is being cut. This can lead to irregular cuts, and a waste of fabric. Use plenty of pins! 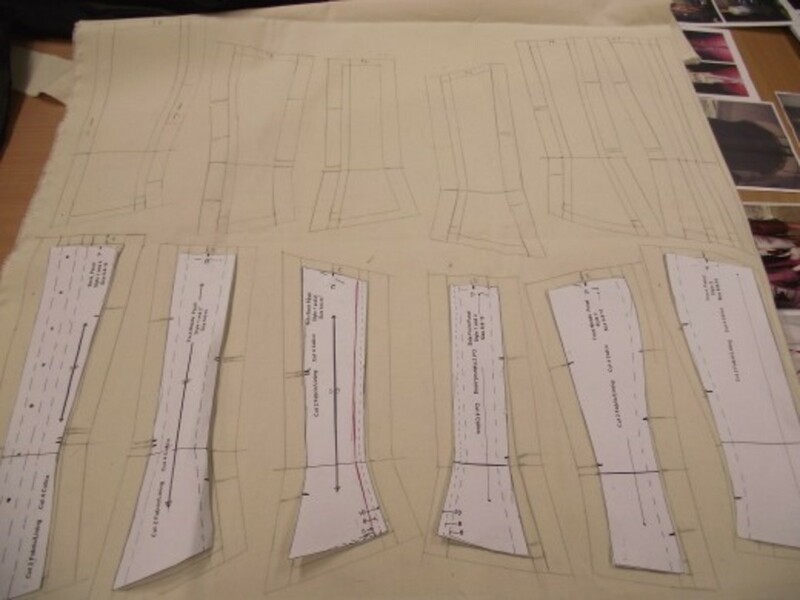 When all sections are individually pinned, cut them out using sharp fabric scissors, following the outer line, which should include your seam allowance. You should now have 12 separate panels, which are 2 layers thick and pinned together. On each panel, stitch along the bottom of each channel, about 1cm from the bottom line. This is to stop the boning coming out, so back tack* across the stitches a few times on your sewing machine, to make sure they are strong. 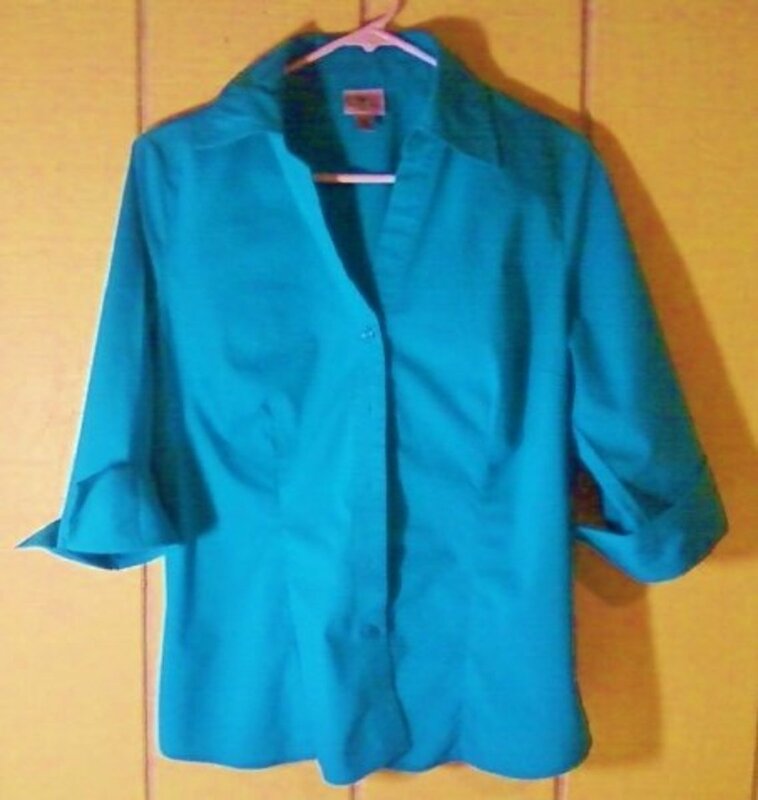 This will now permanently hold your calico layers together, but keep the pins in, for now. 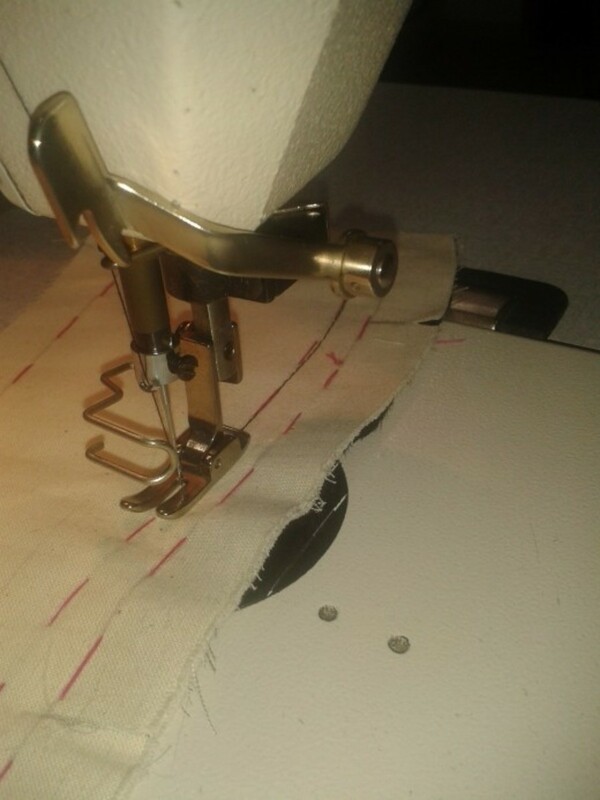 * back tacking is where you use the reverse function on your sewing machine to go backwards and forwards over the same line of stitching, for future use. Back tack across the bottom of the boning channel, approx 1cm from the bottom. Lay out your outside fabric onto a table, in a single layer, selvedge to the bottom. If this is patterned, or textured, remember that the part that you want to see, should be facing downwards, onto the table. If you are using a pattern that you want to "join" up, you will need to plan ahead for this, and cut the pieces so that they link according to the little notches that have been drawn on. Also be aware that you will not see the seam allowance, so do not consider this to be part of the pattern. To be on the safe side, I would suggest using plain satin or something similar, particularly for a first attempt. 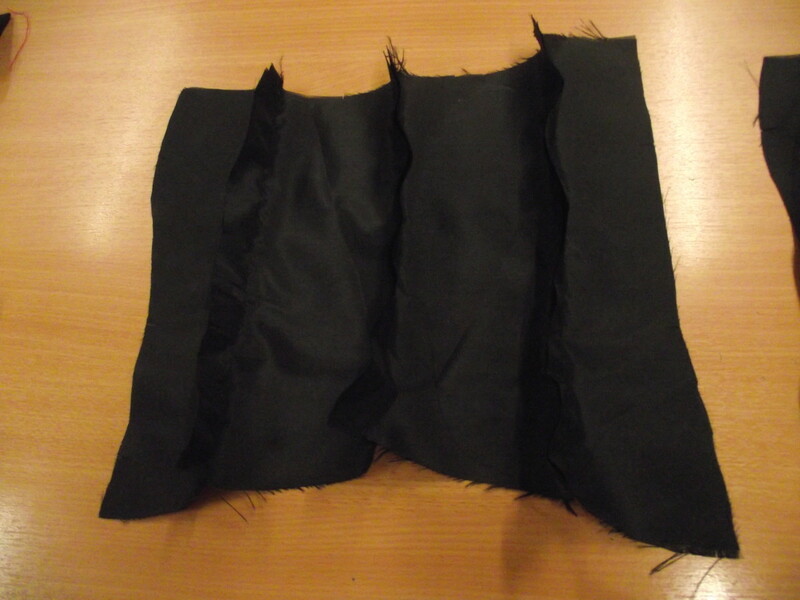 Using the calico pieces as a guide, cut out the corset's outer fabric using your fabric scissors. Be careful not to stab yourself with the pins... I found myself getting a little overconfident at this stage, and constantly stabbed my fingers! 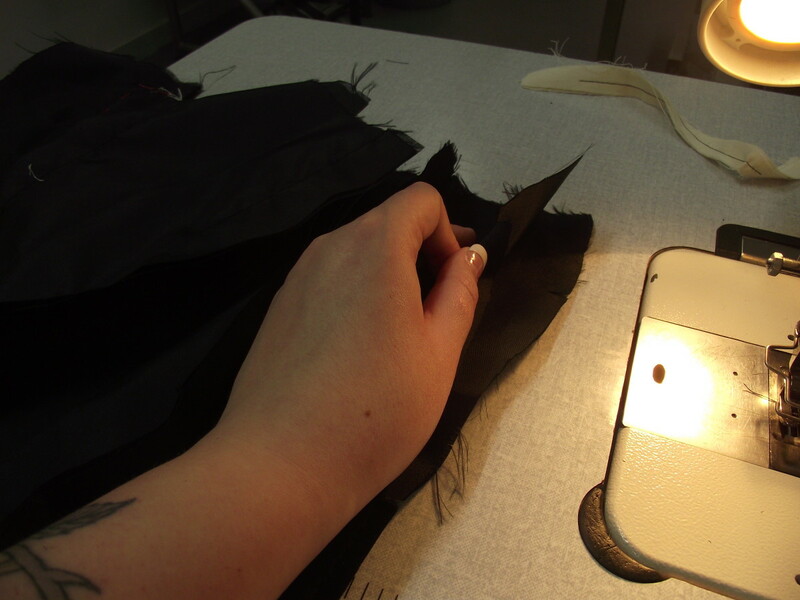 Begin hand-tacking each of the panels, using a contrasting colour of thread. I chose pink, because none of my layers were pink, so it was easy to see. 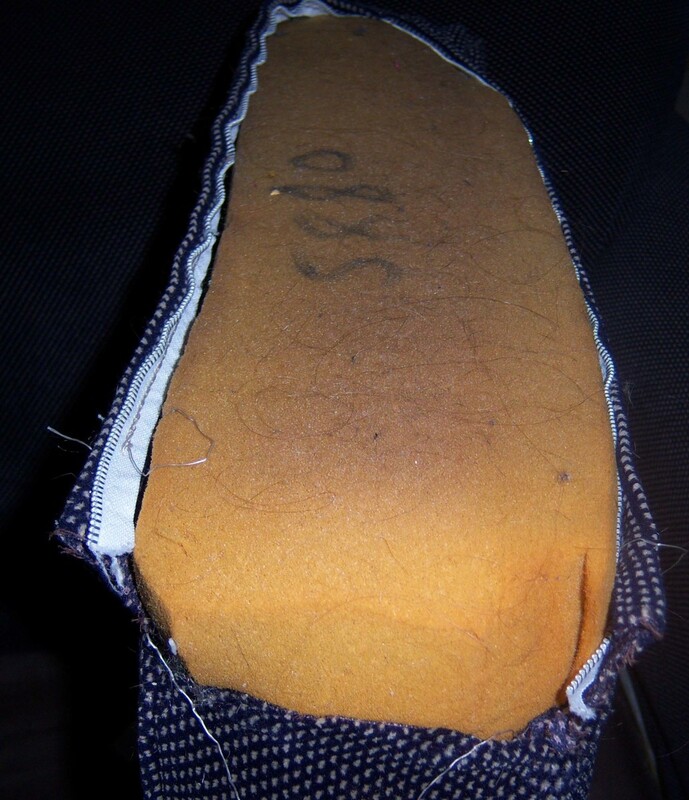 Don't be overcautious with your stitching because they will be removed later. However, try to be neat and follow the lines accurately, as some of the stitches could prevent boning from going into the channels later, particularly when testing that the channels are the correct size! I used a double threaded needle, done by folding the thread over on itself once through the needle, and tying the ends at the bottom. 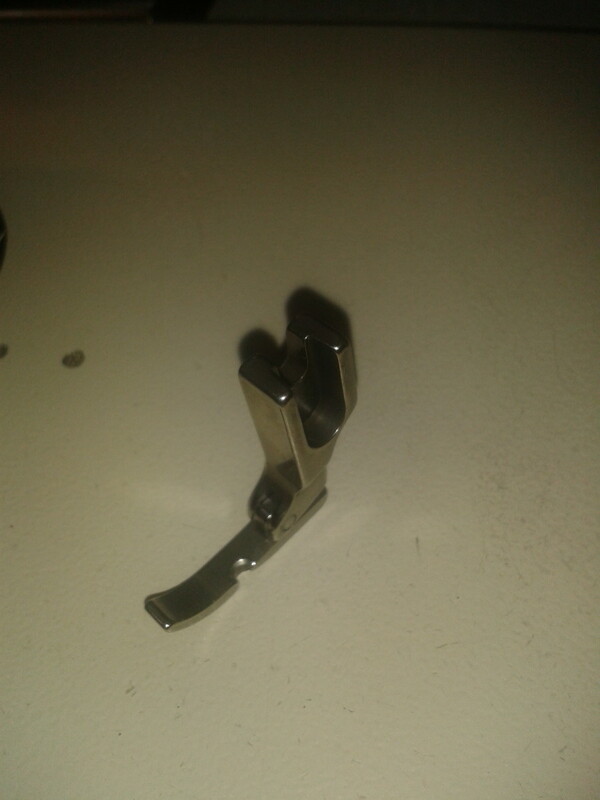 This allows for a nice strong tack that wont snap easily. Be sure to work slowly, and don't be tempted to do multiple stitches at once, then pull the thread through... this distorts the fabric, and can crumple it, as well as tangles the thread. Large stitches (about 1cm each) are best for this, and easier to pull out later. Don't worry about stopping and restarting, or even about changing the colour of thread because you've ran out. Remember that these are for your use, and no-one else will see them. Be aware that this stage is one of the most laborious, particularly if, like me, you do it sitting in bed, hunched over. You should, however, be quite used to the needle pricks by now! Don't rush, or you could pucker the fabric and tangle the thread! The lining fabric should be folded in half, and laid so that the grain is parallel to the table edge. This makes it easier to remember which way the fabric grain is running. Lay out one side of your nicely tacked panels over the lining fabric. (Just A,B,C,D,E,F- one set of panels) Lay them in such a way that the flat edges run along the grain of the fabric, left to right, all in the same direction. The fabric should not stretch. 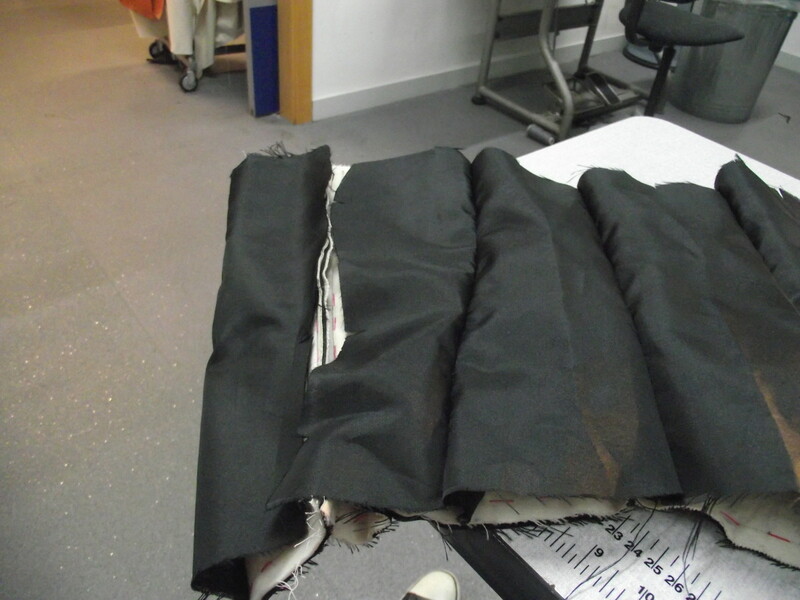 Because the fabric is folded, we will be able to cut the lining required for all panels in half the time! This time, put the right side facing up on the table. The side that you want to be in contact with your body should be facing upwards, then place the calico pieces on top, as a guide to cut around. Try to be economical with your fabric, but do not change the direction of the pieces. They should all be lying, horizontally like a ladder, parallel with the grain of the fabric. Do not cut until you are sure that it is the right way, because you will distort the final results. Using a ruler will ensure that all straight edges are the same distance from the outer edge, thus increasing the chances of cutting on the grain. While all of the layers are together, use scissors to cut in the notches that are marked at the side of each pattern piece. This will help in identifying which pieces go together later. Take panel A and A2. 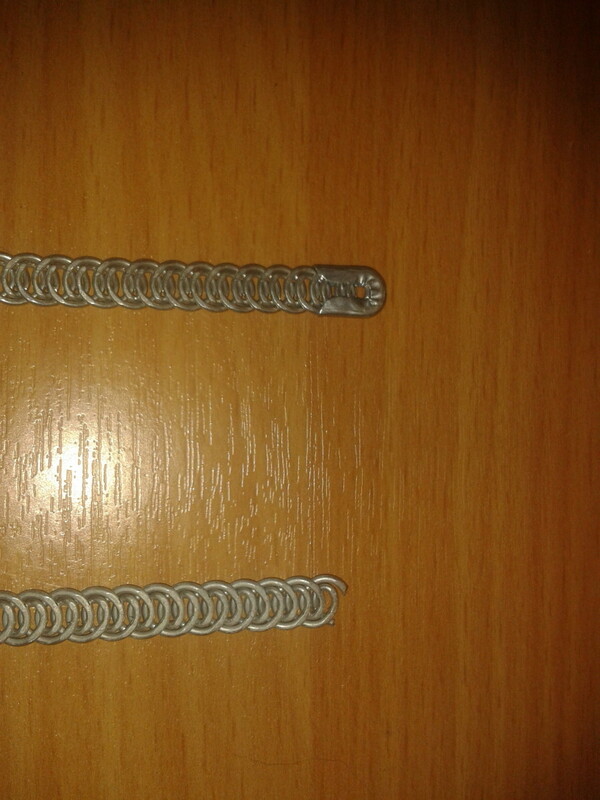 These will be the centre back pieces that have the eyelets and lacing in them. 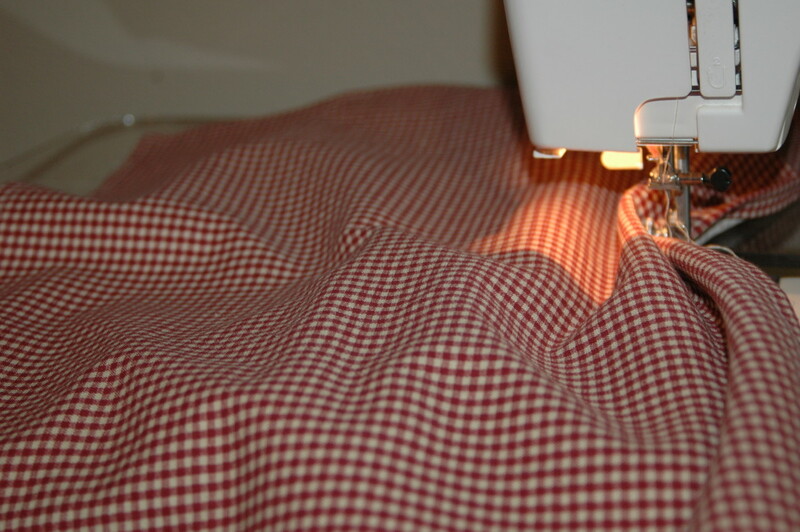 Put the lining to the side for now, and begin to sew the channel lines with your machine. Leave the back outer edge for last, and use this to later attach your piece of lining fabric. At the top and bottom of each line of stitches, be sure to strengthen them by back-tacking a few times. I used black thread so that it was almost invisible on the finished design, but if you're more confident, feel free to use a contrasting thread that would work nicely as an accent on your final piece. Work slowly, as you must follow the channel lines accurately. If you go over the lines, particularly on the inside, you could prevent the boning from going in. Everything would need to be unpicked and redone! Once you have finished the boning channels, attach the lining using the outer edge. This gives a neater finish than if you had sewn the outer edge of the outside channel, then re-sewn the line to attach the lining. 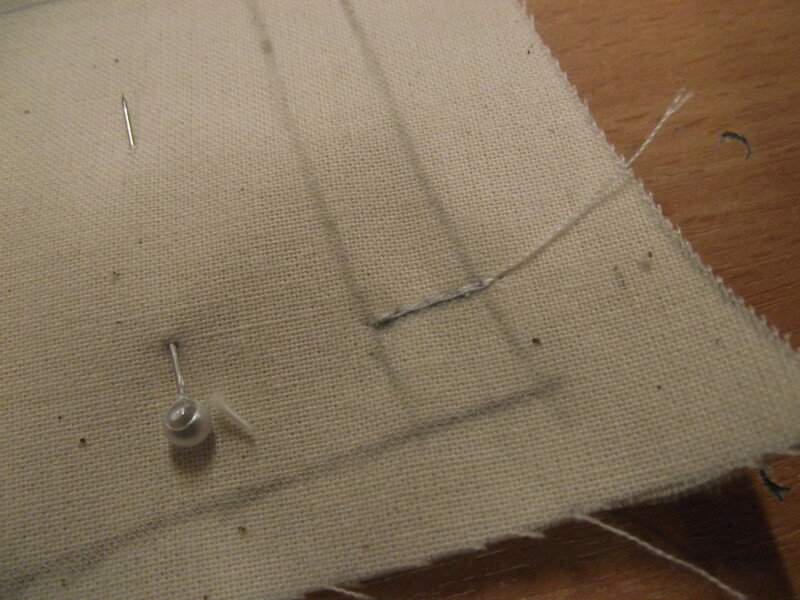 Now, remove the tacking stitches, being careful to remove all of the thread. It should pull out easily, but if, like me, you sewed over it, you may have a slightly harder time of it! Then, slide the rigid bones into the channels and seal them by hand, using small, tight stitches. This will stop the bones popping out. After that, trim off the excess fabric on the sewn centre seam, as this will get in the way with the eyelets. Then pull the lining around and underneath, so that it covers the calico layer. 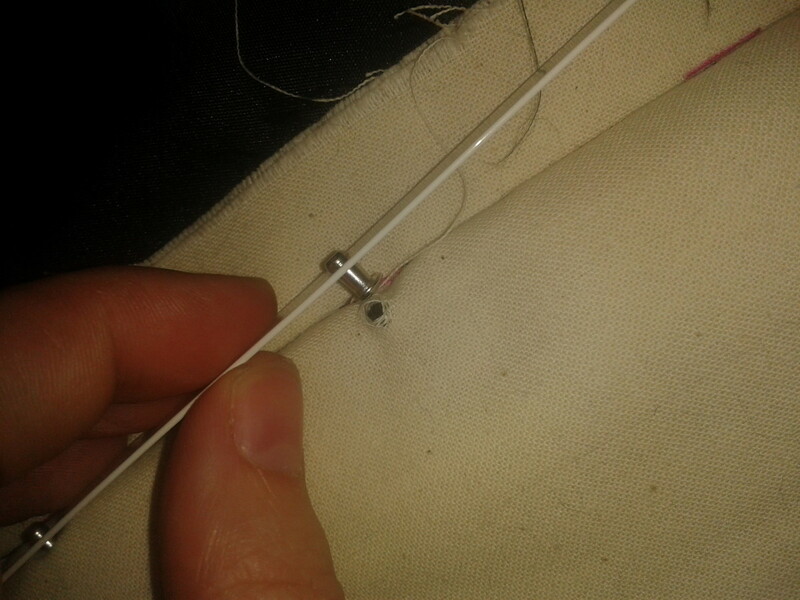 Hand tack into place, along the line of the boning channels, then stitch neatly, close to the outer line to secure the lining, and prevent it from slipping back. You can simply follow the line of stitching on the front! These new tacking stitches help to place the eyelets later. 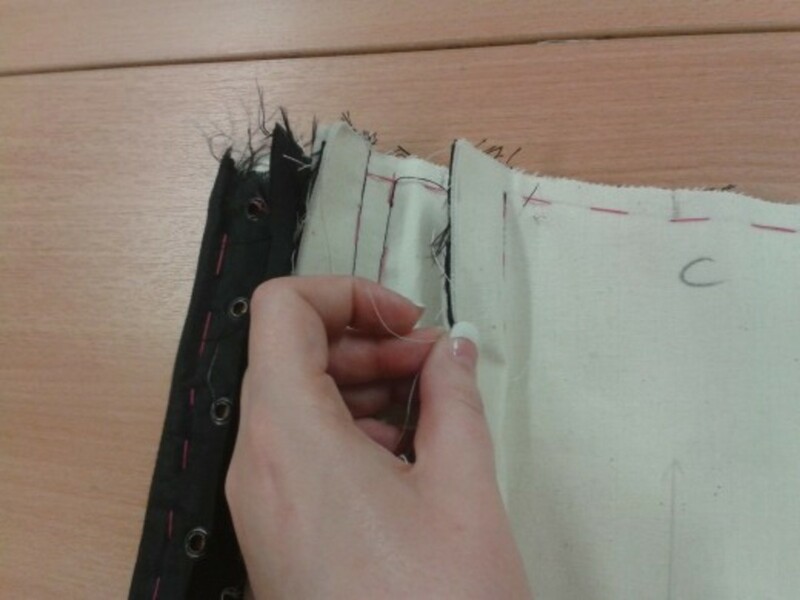 fold over lining and hand tack in place, and sew tightly, as below to secure in place. 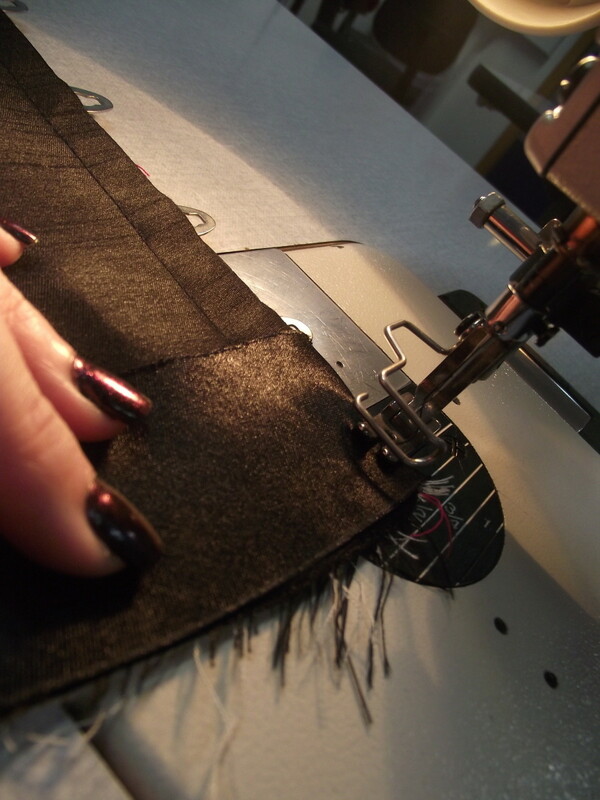 Secure the linig by sewing on the right side approximately a cm from the edge. This will secure the lining and add a professional finish. Carefully pick the tacking stitches and remove. A stitch ripper will be useful for this- but use the protected end towards the fabric, not the pointy end. 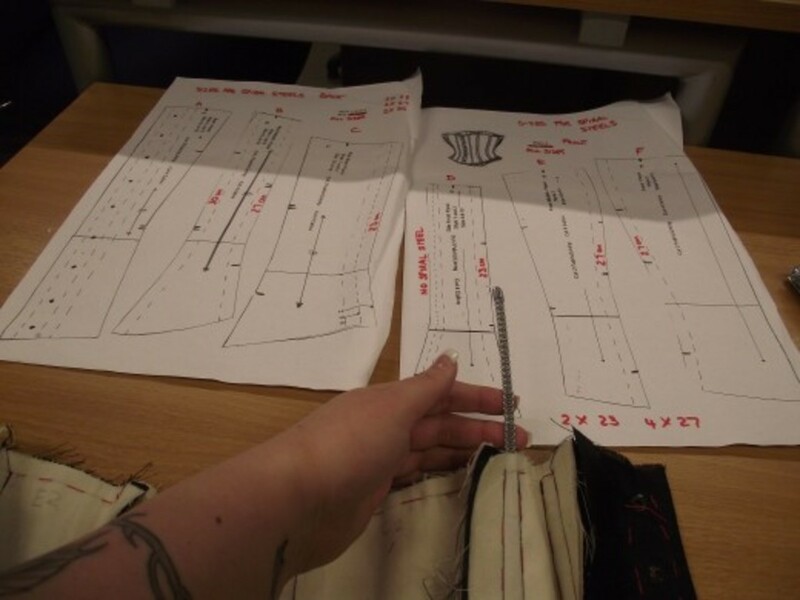 Now, remove the paper and use your own judgement to decide whether the eyelets have been placed centrally, in comparison with your line of stitching. You may find that you have to slightly alter the position of the eyelets, and that's ok, so long as you remember to make any alterations to both sides, so that they match up. Once you are happy with the placement of the eyelets, use a fabric hole punch (the same kind used to put holes in belts) to punch holes. This takes a firm hand- and a couple of tries each time. Also make sure to make the holes smaller than the eyelets you will be using, otherwise they will fall out. Now, put the eyelets through the holes and affix as per the instructions. 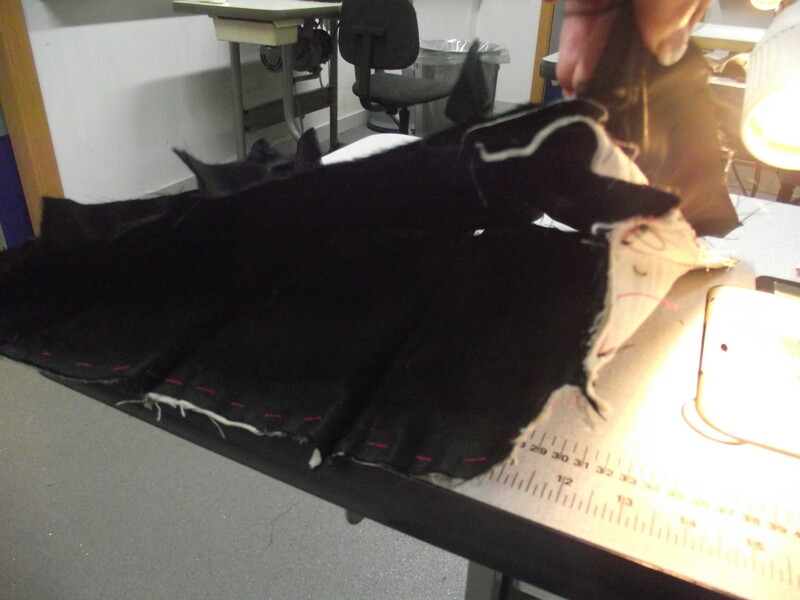 Once all of the eyelets are in place, lay out both back panels together and determine whether they are even. If not, you will have to do the panels again, so try to be careful! Remove any tacking stitches from these panels. Just a note: Different types of eyelets have different instructions. There are handheld eyelet machines that aren't really suitable for this. There are eyelets that can be sealed by hand with a hammer- these are ok, but practice first on some scrap to ensure a nice result. There are also more industrial eyelet machines that use either a hand or foot press to lower the punch onto the eyelet- these are highly recommended for making a corset. 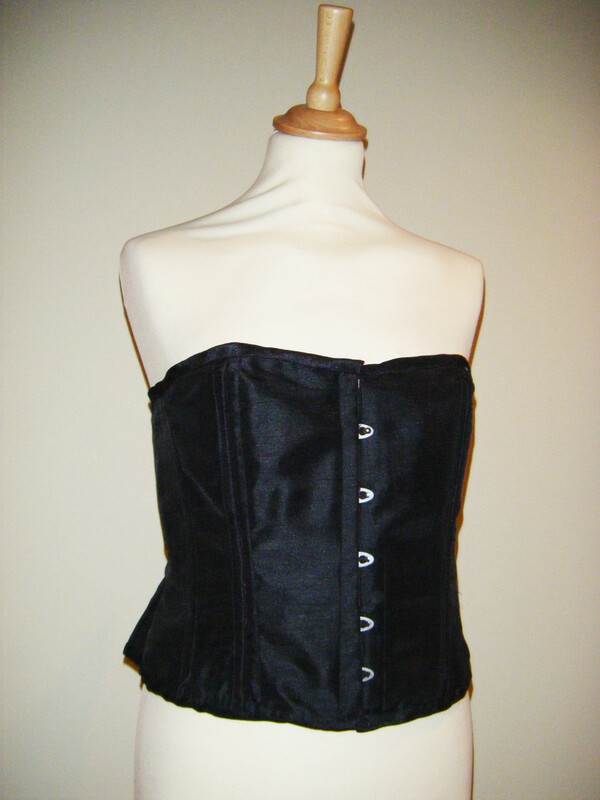 They make the job so simple and so quick, but they may be an unnecessary expense if you only plan to make one corset. Use the pattern piece as a guide for where to place the eyelets. Line up over your A sections, and mark in with a chalk pencil. Flip the piece over for the other side and repeat. Look over and judge by eye if they are even and balanced. Make alterations as necessary. When happy with your placement, make the holes with an awl and then set the eyelets. I have this green grommet press machine and it is one of the most useful pieces of equipment that I use. I have added corset effects to t-shirts, denim jackets and jeans too, and it is really easy with this machine. So much simpler than manually setting the eyelets. I bought silver eyelets as I personally don't like the gold, but the machine comes with hundreds of gold coloured eyelets to practice with. You will need to ensure that the busk is long enough to support the whole length of the corset, otherwise there may be a bit of spillage. 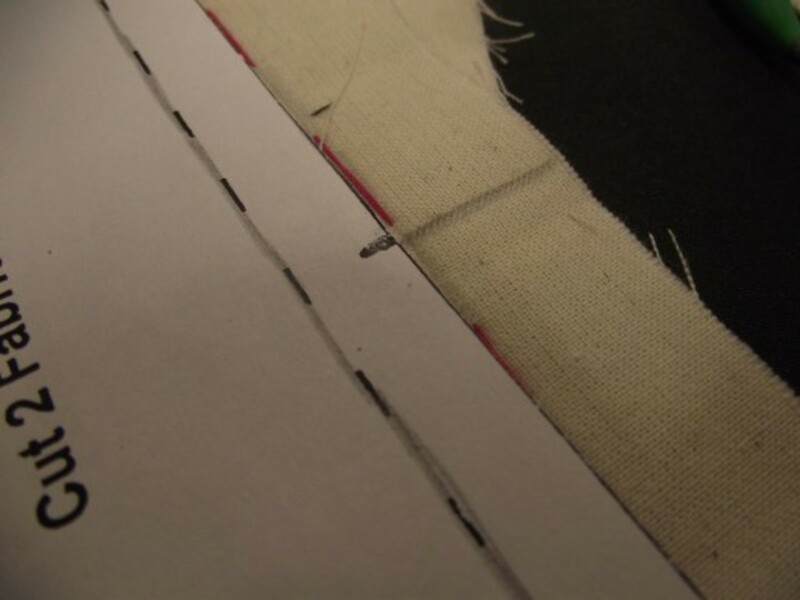 To ascertain the correct size, measure the length of the centre front panel, remembering to discount any seam allowance, as well as another 1.5cm or so to allow for bias binding to be sewn over without damaging the machine. There are two parts to the busk: the loop side and the stud side. The loop side should be on the Right hand side centre panel, and the stud should be on the left hand side centre panel. To ensure no confusion, I suggest marking the top of each side. To determine the top from the bottom, look at the spacing between the studs. They are further spaced at the top than the bottom. Carefully place the loop side of the busk along the seam line, so that the loops overhang onto the seam allowance. Make sure that there is an equal distance between the top and bottom edges. Then, use a pencil to draw around the loops- this will provide a guide as to where to leave the gaps for the loops to poke out of. 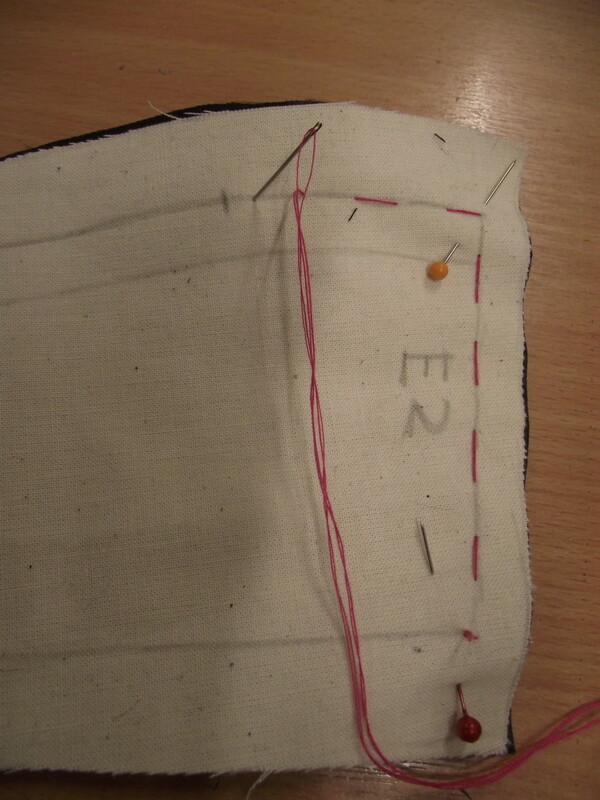 Now, sew along the centre front seam, remembering to back tack any time you stop and resume sewing. 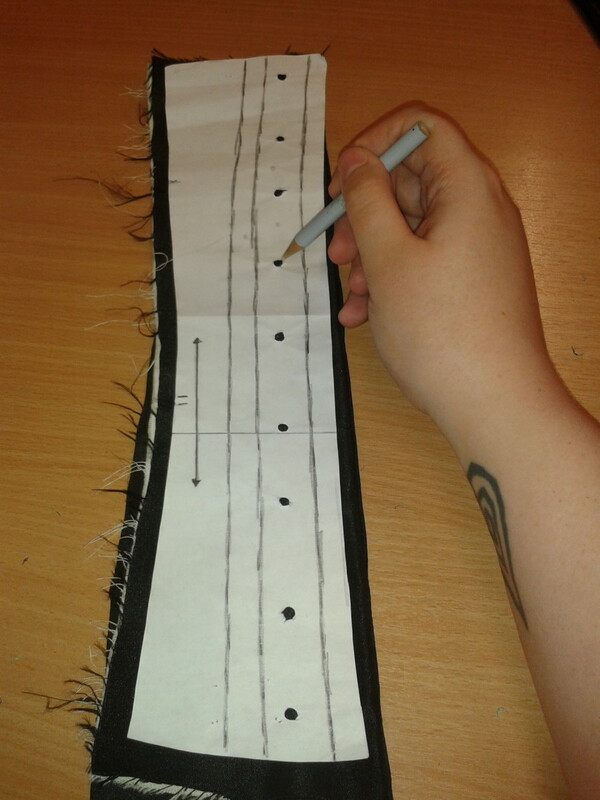 This is especially important, as you will stop regularly at the loop markings to leave gaps to allow the busk to be pushed through, and it is very important that the remainder of the stitching is very strong, so back tacking is a must! Then, iron back (wrong sides together) so that the right side of the corset is in view. 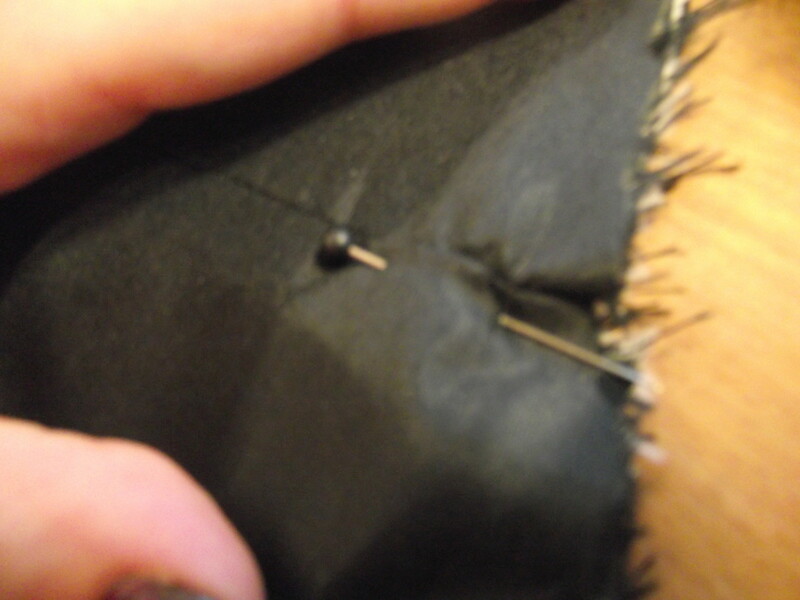 First of all, sew the centre seam and iron back (wrong sides together) so that the front of the corset is now visible. Then, lie the front panels down, side by side, right side up, so that you can see where the loops from the right side lay in relation to the left side. You should ensure that everything is lying straight, and the panels are parallel to avoid messing this up. Allow the loops to overhang over the left side, and make a small mark with a white pencil from inside the top loop. This will give you a starting point to put your studs through. Double check before making any holes! 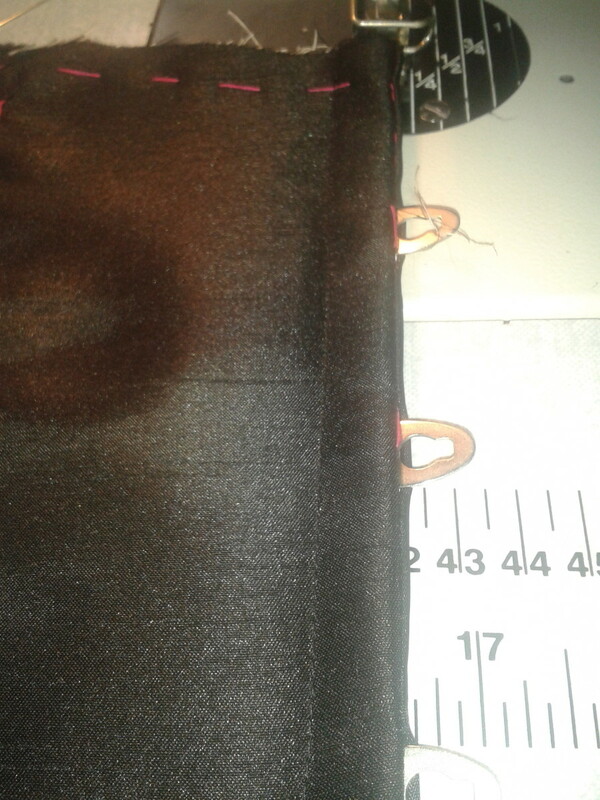 Trim back any seam allowance inside the panel to approx. 1cm, to avoid having to puncture too many layers, and iron flat. 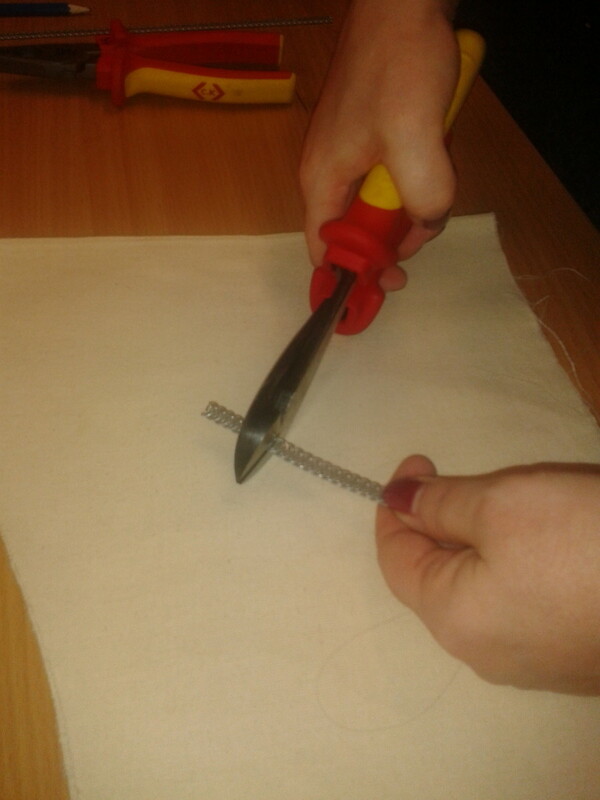 Then, using an awl, push a hole through the fabric (from the right side to the wrong side, to avoid any fraying) and push the first stud through the hole. This does need a good bit of brute strength, and try not to distort the fabric too much while doing it. Once the first stud is through, check that they match up to the top loop, and that the corset looks even at the front at this stage. Then, use the busk as a guide as to the position of the other holes, and repeat the process, one stud at a time. Don't rush ahead and pierce the holes before pushing the stud through, as the fabric may stretch and the holes will no longer be in the correct place. Once all the studs are through, check that the loops fit nicely over the studs, and remove any tacking from these pieces. force the nodules through the holes. Check alignment of hooks to nodules. Stitch the remaining panels of lining together. This is a tad tricky because you will be doing it by eye, without any lines to follow. If you feel that it is easier, you can chalk in some guide lines, but remember these will be visible on the finished article- probably not an issue if the corset is for yourself. Remember to allow for the seam allowance around the panels- 2cm at the sides, so you will simply follow the shape of the panels. Remember to flip the panels over when doing the other side of the lining, so that the edges aren't exposed on the finished article. 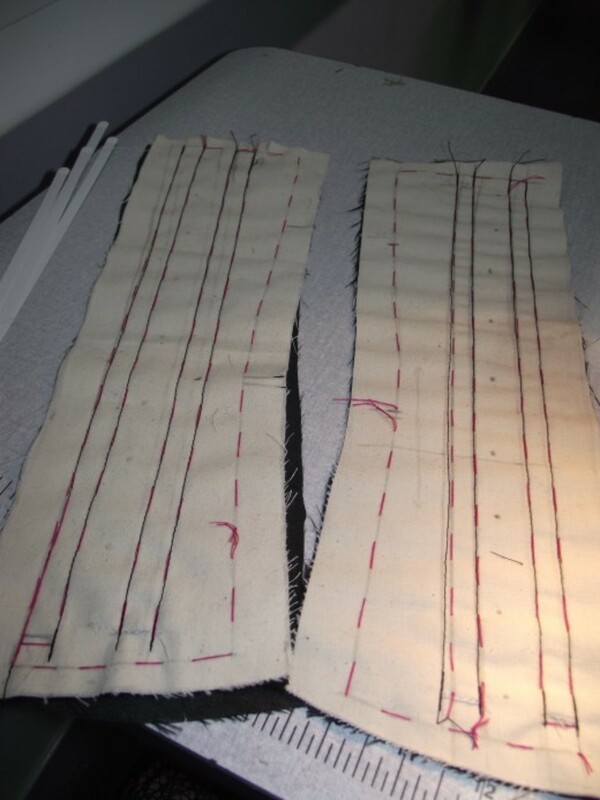 Also be careful to join the correct panels- it would be a good idea to lay them all out in order, join to join underneath the corset panels, in order A-F. Then, make sure that the sides you are attaching together are the same shape. Refrain from pulling on the lining as you stitch, as it is likely to stretch and distort. In the same way you did with the lining, begin to join the panels together. Remember to back tack at the top and bottom of each line of stitching. Work slowly and carefully, remembering to check after each line of stitching that you didn't cross over any lines- this can be particularly tricky at the boning channels. Also be aware that the lining that is already attached to the front and back panels should remain loose on one side so that the remaining pieces can be attatched later. To avoid any issues, i placed the panels i was joining on top of each other panels (right side together), and then used pins to join together and act as markers, making sure the placement was correct for each panel before sewing. You will develop your own feel for this, so don't worry too much about it, and remember you can always unpick the stitches and try again. Also work slowly- if the machine runs away with the material, it will no doubtedly cause puckering, and this doesn't look very professional. Once you have joined the panels together, lay them out alongside your joined lining pieces, and compare the shapes and positions. Lay the lining over the panels to see if they fit nicely, and if there are any differences, now is the time to fix them. 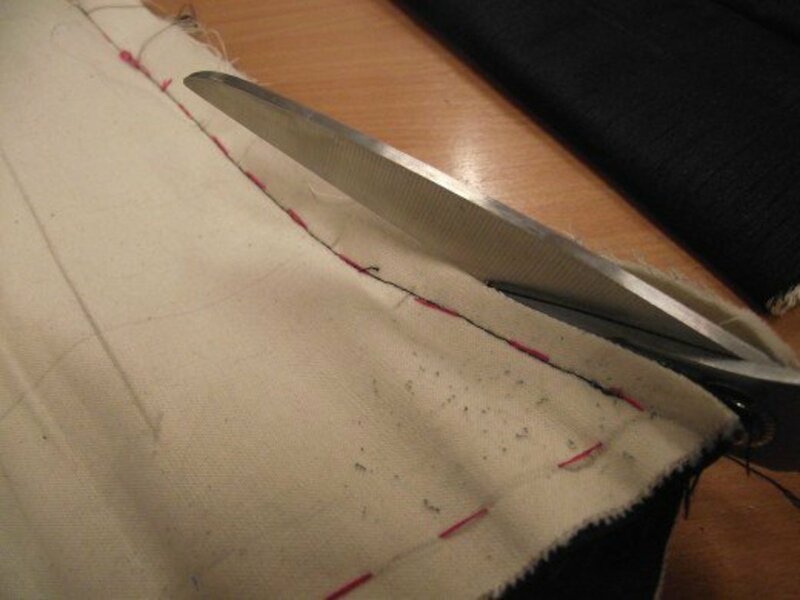 It is very easy to make mistakes with the lining, in particular, so give that a good check over. Then, try the corset on and alter if required. Remember that any alterations done on one side, will have to be done on the other. If you are happy with the fit and you don't need to let any of the seams out, you can now trim the edges down to 1cm to give a neater finish and prevent any bulging later on. Now that everything is joined together, you should insert the steels into the boning channel, and hand stitch together at the top to prevent them from coming out. You can buy the steels at pre-cut lengths, or as an endless roll that you cut to size. In terms of ease of use, the pre cut sizes are the better option. However, in terms of economic value, the roll is much better. If you decide to get the roll, you will need to cut to size and also buy end caps to finish each length with. You will need a pair of snips and a pair of pliers, as well as a firm grip. 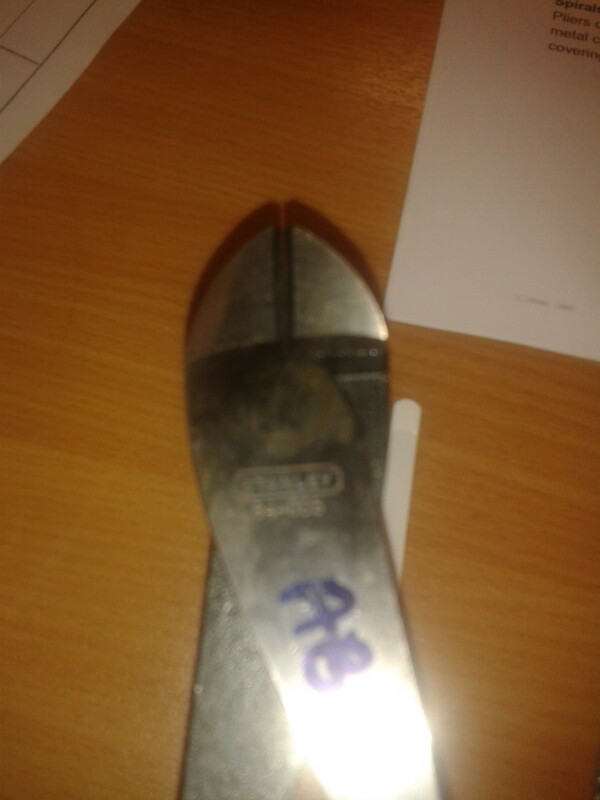 You should grasp the steels in the snips at the correct length. Then, cover with a cloth or towel to ensure that no stray pieces ping back into your eyes (safety first, kids) and squeeze the snips to make the cut. 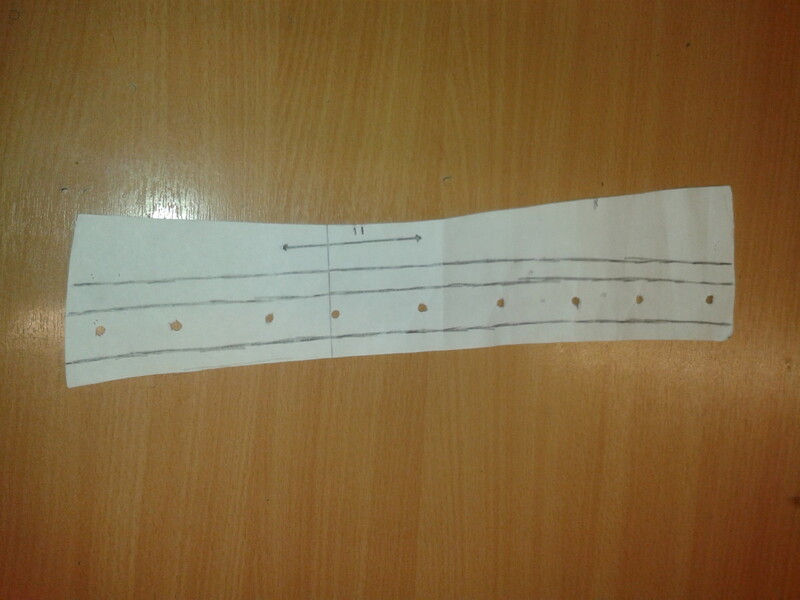 **To determine the correct length, measure the length of the bonng channel using a tape measure, and remove the 1cm that you have taken from the bottom, and another 1cm from the top to avoid snapping the needle when attaching the bias binding. It is a good idea to write this on the pattern for future reference. Once the length is cut, you will need to place end caps onto the ends of the steels, and secure by squeezing with the pliers. Slide the finished steels into the channels and stitch closed. This is easier than it seems from the pictures, I assure you. You will attach the lining to the pieces on panels A and F. So, lay the pieces out (right side up) on top of the inside of the corset. Again, make sure they all fit, then attach lining panel E to lining panel F by turning them wrong side in, and stitching as normal, making sure to hold all of the other panels well out of the way. This is where it gets slightly more complex. You will need to remain working wrong side out, so as there is no rough edges showing on the finished piece. 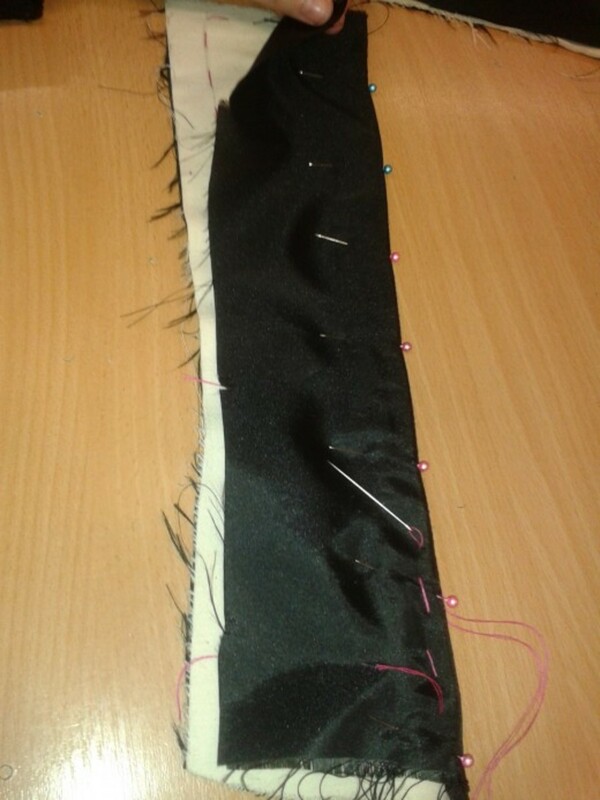 So, with the lining pulled over the front of the corset, and meeting at panel A, stitch together to form a loop. Then, turn inside out. That's the complex part. Not very complex is it? 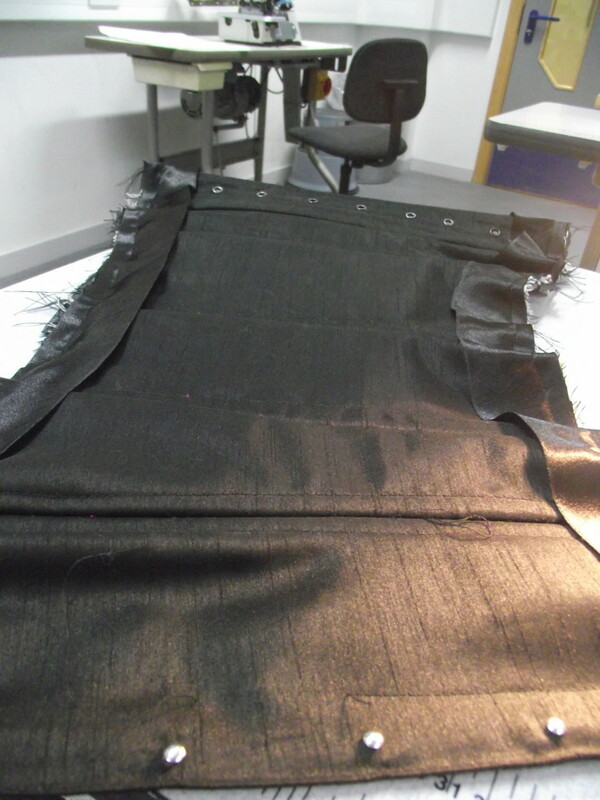 Now, lay everything flat and smooth out to ensure, again that the lining hasn't stretched during the process. 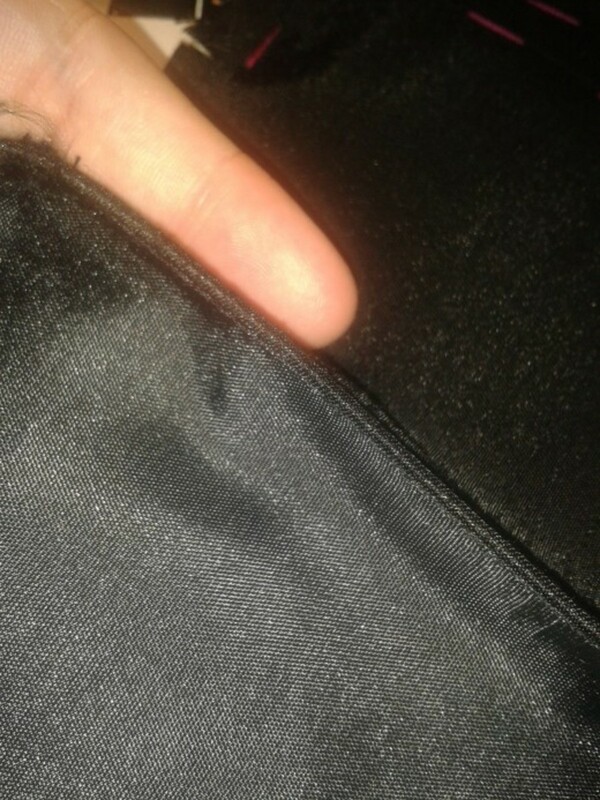 Underneath the lining, you will notice that the seams are still bulging, and pushing the lining out. 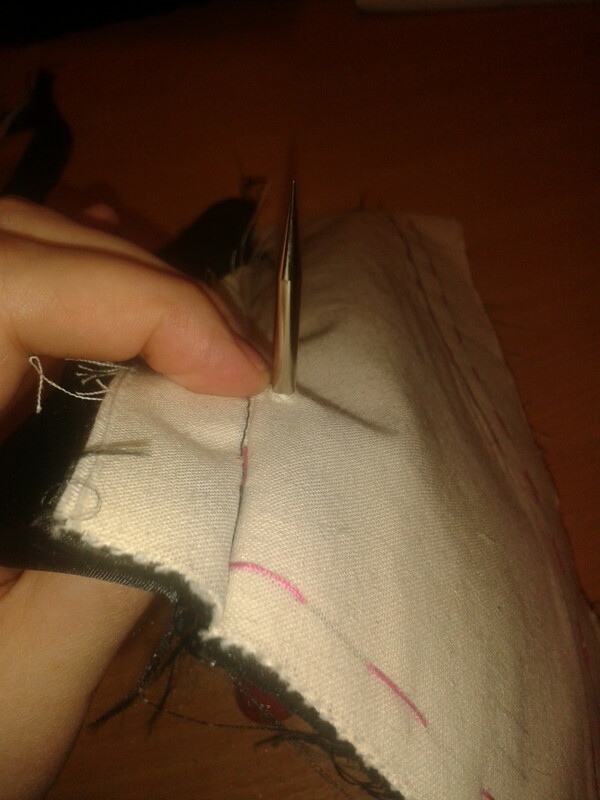 To remedy this, put your finger in the middle of the material at the seam to flatten it, and pin the lining in between. Repeat for all seams, top and bottom. 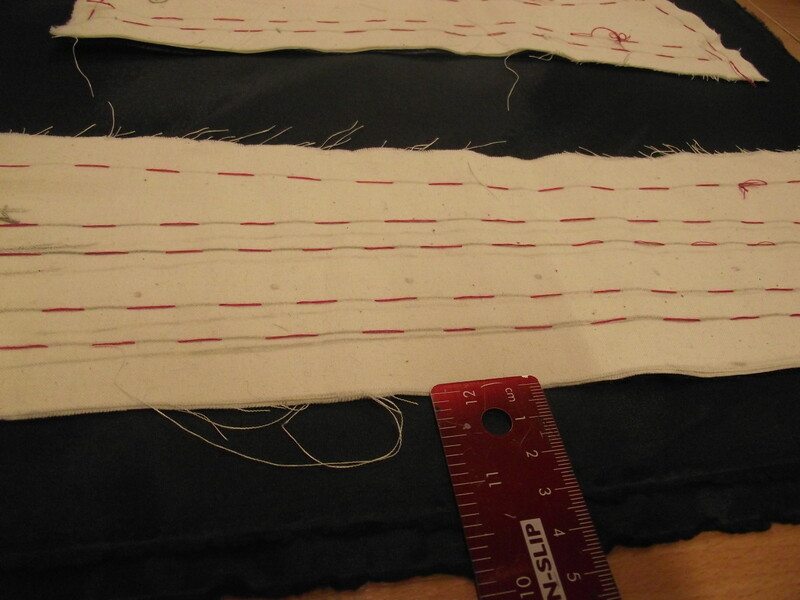 Then, sew along the top and bottom of the corset, as this will hold the seams and the lining flat. Trim off any excessively long threads or frays from the edge, and repeat all of the above for the other side of the corset. flip back to normal- no visible stitching! You can use Bias binding tape for this, but it is often hard to get a colour match. The tape is also usually quite thin, so I wouldn't recommend it unless you have wide binding tape (approx. 25mm). 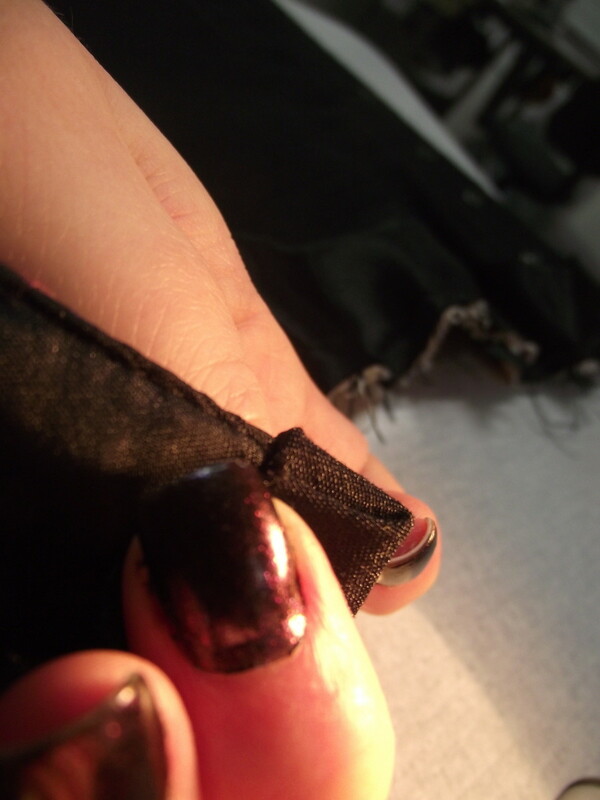 If you use bias tape, you simply fold over the edges, tuck in any frays, and machine onto the corset. 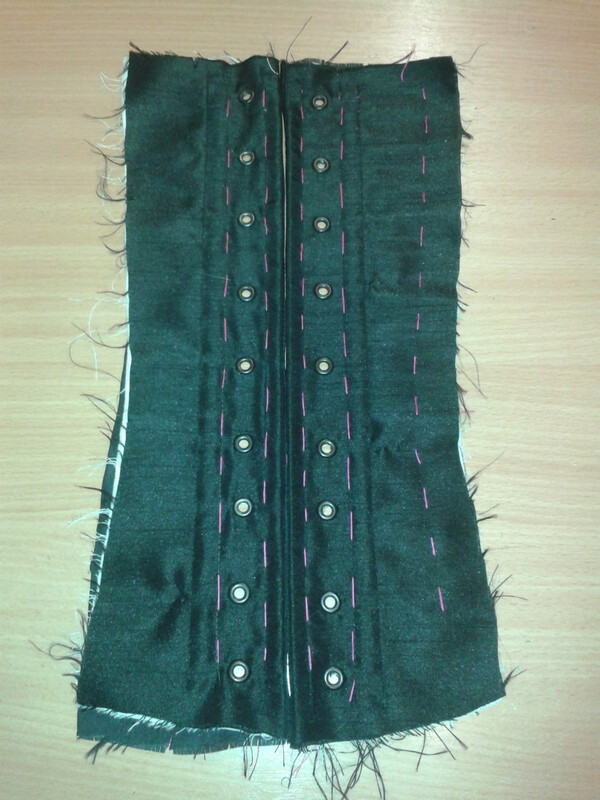 Then, place the strips over the edge of the corset, with the right side facing down. 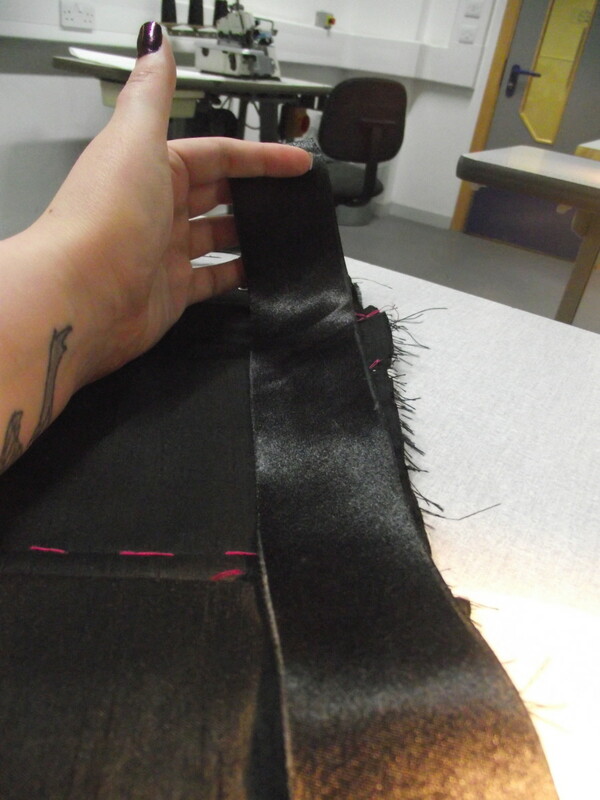 make sure that the tape is in line with the edge of the corset, and pin into place if necessary. 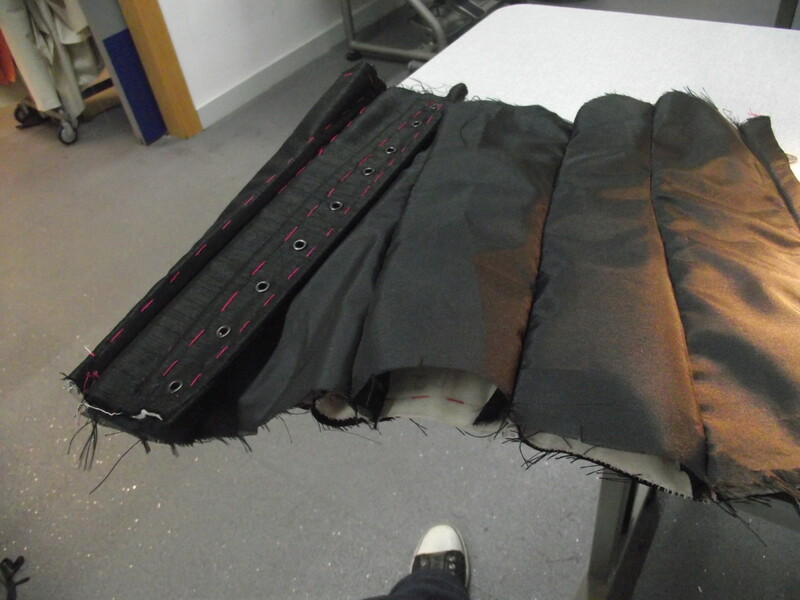 Tuck the ends tightly under the corset, so they are over the lining- this will ensure a neater edge. Then, machine over the binding approx. 1cm from the bottom of the corset. Sew slowly and carefully, avoiding any steels. Repeat for the other edges, top and bottom. 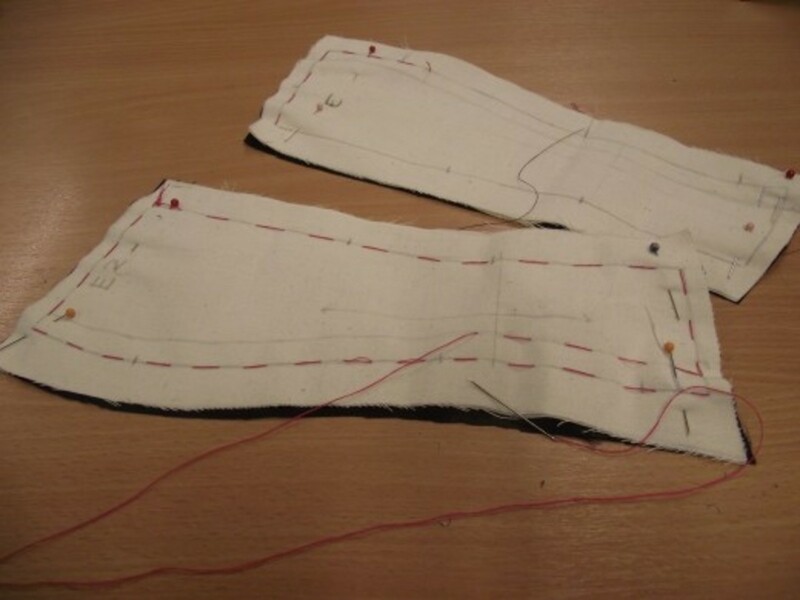 Try to remember that the corset is symmetrical, so it is a good idea to make sure the bias matches up at the centre pieces- compare the centre edges with the other side before sewing them down, because you can then adjust the set accordingly, rather than having to unpick the stitches later. 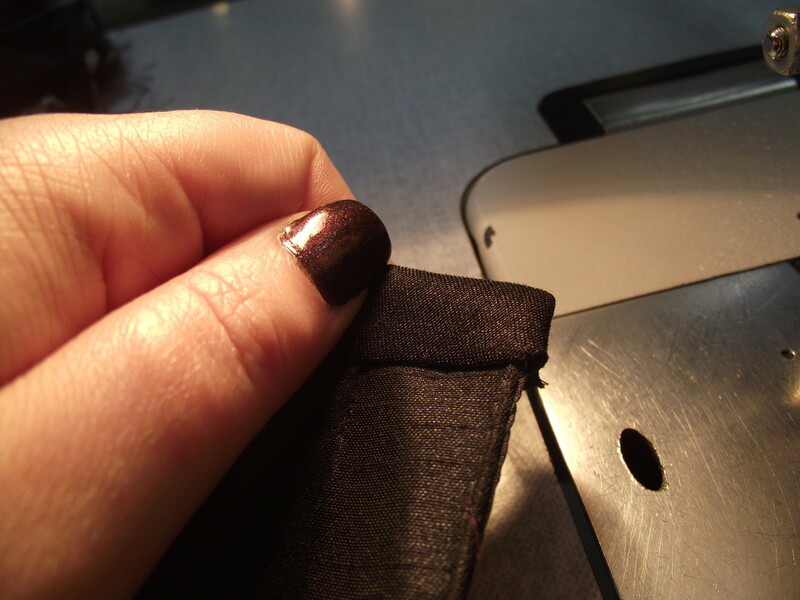 Now, fold the binding strip over the edge of the corset, tucking in any stray threads as you go. Then, roll the outer edge under on itself, and neaten the corners at the edges. This will ensure a nice edge that wont fray. 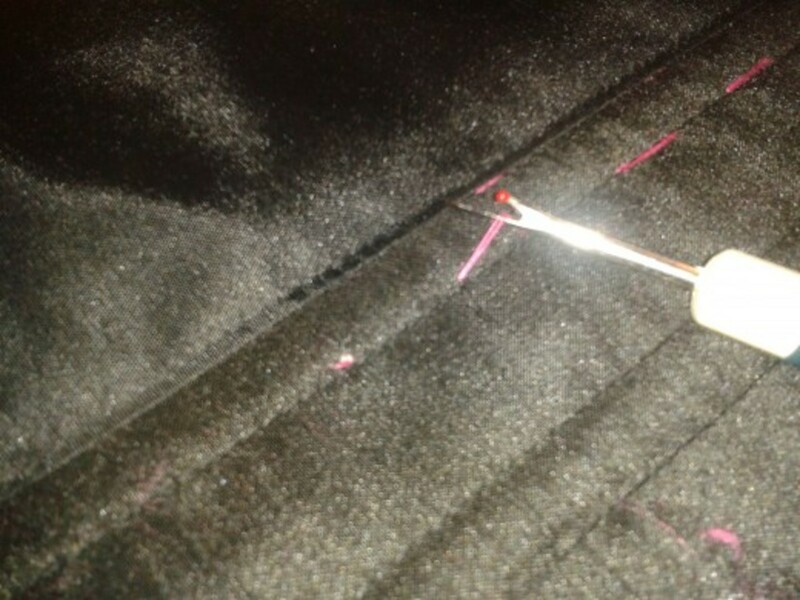 Again, pin in place and hand sew along the inner edges to secure. At this stage you should remove any tacking stitches if you haven't already done so. Try to avoid leaving this to the last minute. If you can, unpick as you go. I left mine to the last minute, and they had been stitched over 2 and 3 times, and it just made it so much harder to remove!!! Now, lace up your corset. It should take 3-4 meters of lacing or ribbon to do so. Remember that if you intend to use your corset for tight lacing, or even pulling you in a couple of inches, it is imperative that you get a lacing material that is fit for purpose. Decorative ribbon generally doesn't meet the standard required as it isn't strong enough, and it just squishes together as soon as any tension is placed on it. 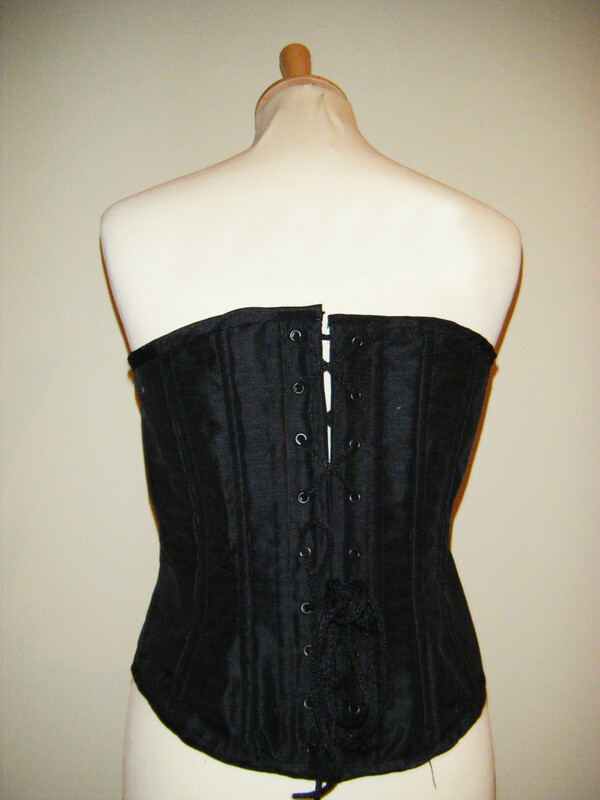 Enjoy your new corset, and remember that every time you make one, it should be easier. You will find your own little short cuts or deviations, and your own way of doing things. Let me know how you get on, and leave a comment if there is anything you need clarification on, I'll be happy to try to help, or at least point you in the right direction. Thanks, Julia, that looks quite good, with video links too! I don't usually allow links in comments, but I will make an exception in this case! Im sure I will refer to this later! WOW! I was amazed!!! It is so helpful! I made my first corset and it was beautiful, thanks to tutorials I found there! Tatiana is a great teacher! Wow, amazing! 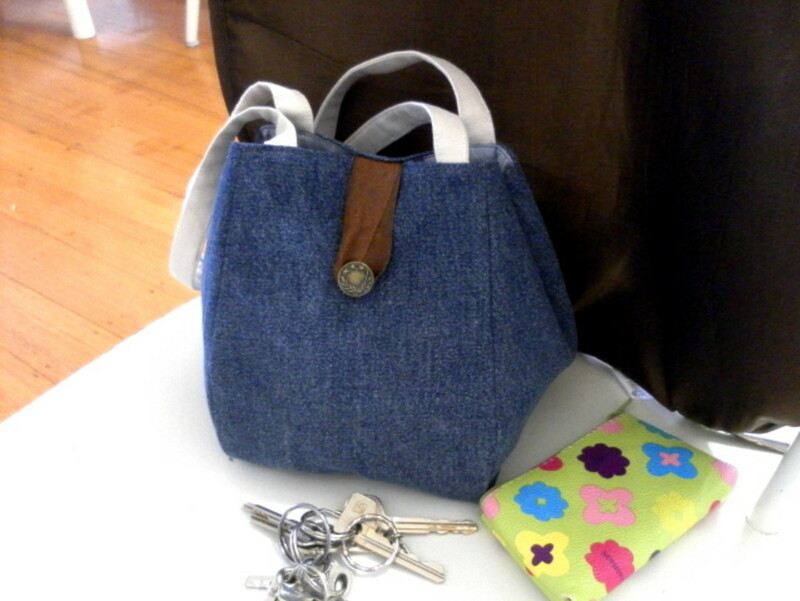 I'm just learning now how to sew, and I would love to make one of these. 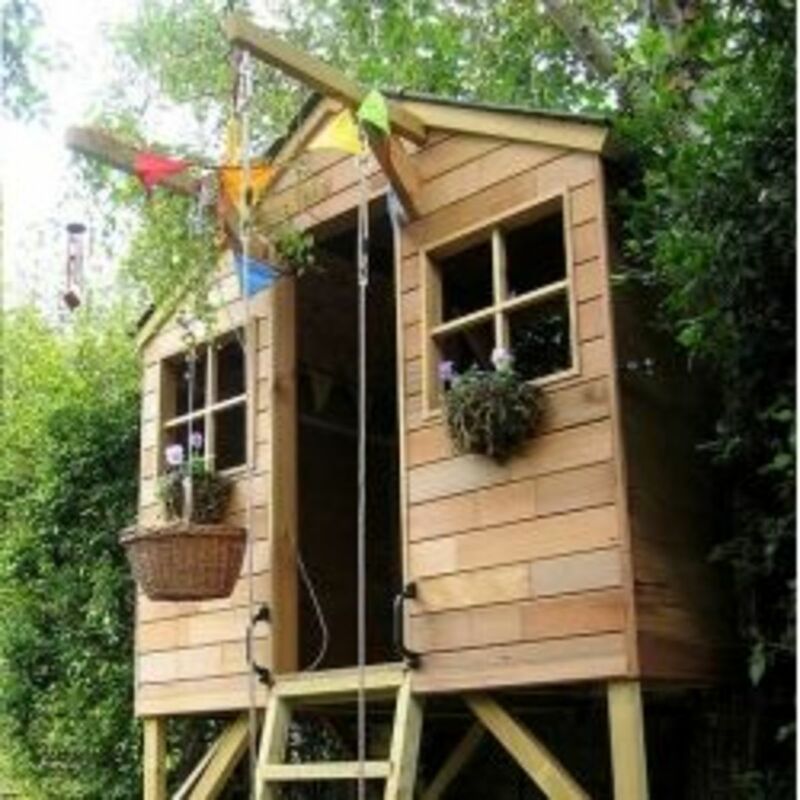 Great idea for a hub and the directions and pics are top-notch. Voted up and useful. I was literally JUST looking up how to make a corset! I want to wear one for the renaissance festival. This is perfect :) Thanks for this hub!